I interviewed them at Blue Silo. How did you end up in this part of RiNo? Reed: Our friend Ken Peterson [who runs Edge Gallery] had a place up the street called Packing House Studio, where they held punk rock shows. We got to know the area. Chandler: Artists seek out places no one else wants to go, so we wanted to be off the beaten path. Many artists work in this area of north RiNo. Reed: This large brick building was a creamery in the early 1900s. Part of the building goes back to the late 1800s. We bought it in 2000 and converted it into studios in 2003. Chandler: Our first tenants were muralists working on massive commissions. Originally the building had four rooms, but the layout didn’t work. We divided up the space. Jeff: In adapting this turn-of-the-century building, Chandler and Reed made it perfect for artists. Reed: We have 15 large, affordable studio spaces for painters, printmakers, and sculptors, along with a recording studio and art installation and moving services. Chandler: We wanted to keep the space as raw as possible. We call the artists’ workspaces “dirty studios.” They’re private, with walls from floor to ceiling. Every space is different. 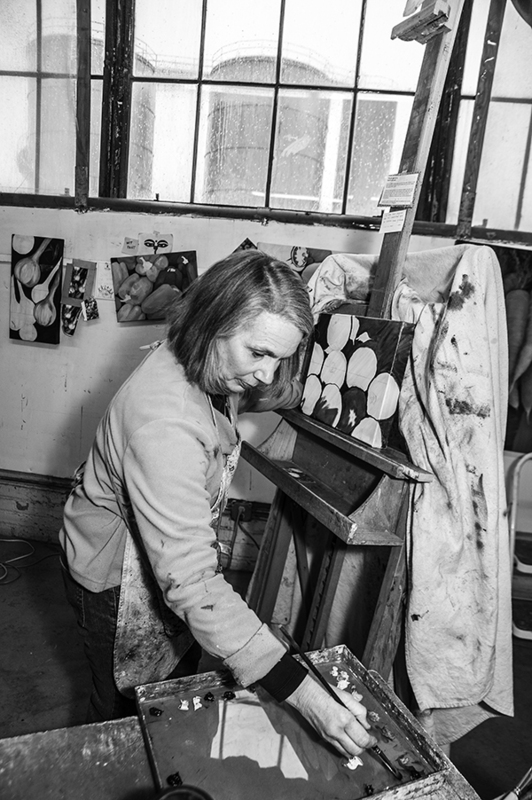 For example, Patricia Zilinski is an oil painter and silk dyer and weaver, and her studio is filled with natural light. It has fantastic views of the silos. Jeff, you came to Blue Silo in 2005. Talk a little about your work. Jeff: Back in Oakland, I was working as a sculptor and doing large-scale installations. One day a friend gave me a box of industrial sewing thread spools. I put them on a shelf. Then one day inspiration struck, and I began to toy with them. The sewing thread has been my primary medium since I came to Denver. Chandler and Reed, you’re both artists and have helped create communities of artists. Reed: We have several properties in north Denver, including galleries in the Navajo Street Art District, and Chandler serves on Denver’s Commission on Cultural Affairs and is the RiNo Art District Board Co-Chair. As artists ourselves, we understand that artists need room to experiment and even to fail. Chandler: Fine art is the art of pure creation. Fine artists often work on spec—they’re more about process than product. And they need below-market space to work. Reed: It’s easy for artists to get isolated. Here they can push boundaries and build a sense of community. Several Blue Silo artists are participating in the Scrounged Exhibition [running through May 19 at Republic Plaza], for example. Jeff: Experimentation is the most interesting part of being an artist. I just finished a piece called “Screw U” for Scrounged, and various objects I had on hand informed the design. The area is part of the new National Western Center redevelopment [a 10-year plan to remake the stock show site into a year-round event and entertainment complex]. How will that affect Blue Silo? Chandler: We’re planning to stay. If necessary, the city has said they’ll relocate us elsewhere on the campus. No matter what, Reed and I are committed to supporting Denver’s artists for the foreseeable future. To find Blue Silo Studios, head up National Western Drive. The building’s in front of tall silos and across from the Stockyard Saloon. You may get a little lost, but that’s part of the area’s charm.